I admit, Paris Is Burning seemed at first blush an odd choice* for the “White Elephant Film Blogathon,” as a onetime Sundance award-winner it's not exactly an obscure curio. Yet the film I was given is also a bit of a forgotten treasure, perhaps looked upon in recent years (if at all) as a time capsule piece. In fact, a digitally restored print recently made the rounds at Outfest LA and elsewhere, and while the print currently streaming on Netflix is of lesser quality. it still beats the VHS I'd once watched. So yes, I'd seen Jennie Livingston's doc once before, not too long after it came out in 1990, it seemed the perfect film for me at the time as a recent transplant to San Francisco, straight but interested in learning more about gay culture after moving to a famously gay-friendly city. But the film is also very specifically about Harlem, New York, drag balls, an incredibly unique subculture with its own language. The flamboyant costumes are just a part of what makes this film so memorable; as a look at African American gay men, as they put it themselves, a group that has "three strikes against them" (together black + male + gay), it is a moving portrait of people who long to belong, who embrace the sometimes cruel world with humor and panache, and who have found their calling. That calling is the Ball, a mix of modern + gay infused with elements of classic debutante ball, costume ball, and royal ball, with modeling shows. What's fascinating too is how these balls aren't just superficial fashion shows; they have a extraordinary array of very specific subcategories from military to glamorous, from businessman ("executive realness") to schoolboy/girl realness, that give the participants a chance to play act in roles that they're not often allowed to play in real life without feeling closeted or that it's unattainable. As the Cheryl Lynn song we hear in the film goes, a frequent goal is "to be real." A sharp-tongued emcee comments throughout these shows with gems like "he's dressed like the kid who just robbed you in the streets before you came over here." I can't remember another film that so poignantly and accurately captures the new families some gay men create for themselves after being estranged from their birth families. Some of these performers were thrown out of their homes, and the "houses" shown in the film (with colorfully intriguing names like House of Extravaganza and House of Ninja) that participate in the balls are homes in more ways than one, giving the "children" a new support system that you get the sense is often a life-saver. 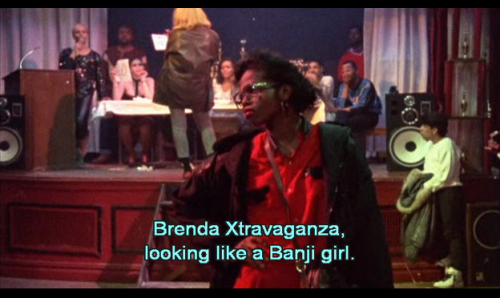 From a filmmaking standpoint, the most important, overlooked element of Paris Is Burning is the absolutely astute editing. The film flows from one character to another, to one subtopic to another, with such natural ease that belies how complicated it is to put a film like this together seamlessly. It remains fascinating throughout, obviously a testament to the unforgettable characters portrayed in it, but also to how tight but subtle the editing is. It doesn't shy away from the imperfections of the people who participate in these balls, either; we see some cattiness (one participant is told by emcee his fur coat is a lady's fur coat, after being tipped off during a men's clothing competition, which leads to a confrontation) and surprisingly brutal competitiveness. We learn a lot of terms unique to the balls, like "reading" (which seems to be an Oscar Wilde-like cutting remark on a personal level, slurs and insults designed to throw off a competitor that can be playful or not) or "mopping" (stealing). The film also taught me that these guys did "vogueing" first, before Madonna was either inspired by (or ripped off, depending on your viewpoint) to make it more famous in her "Vogue" song. It came from ball contestants doing a one-on-one direct competition with each other to duel on the dancefloor, aimed at emphasizing the face, "a safe form of throwing shade" as one person in film puts it, the name borrowed from the fashion magazine. Nor does it shy away from sexual politics, or from how race also affects these men's worldview, even if sometimes in cynically playful ways (one scene shows a fashion show where they are dressed up in stereotypically rich, white ways, in yachting outfits that would impress Thurston Howell but with added gay flair). One man in the film points out how many minorities watch very white soaps like Dynasty or The Colbys (dating it), they see ads extolling the upper class white lifestyle, where kids play in lawns instead of in concrete jungle gyms. "When it comes to the minorities, especially black, we as a people for the past in 400 years are the greatest example of behavior modification in history of civilization… We've had everything taken away but we've learned to survive. that is why in the ballroom circuit it is obvious if you have captured the Great White Way of looking or dressing or speaking, you is a marvel." The only time the film steps away from this world is to show a glimpse of straight modeling, complete with Eileen Ford and insipid journalists, which serves as a juxtaposition for the hopes and dreams of the Harlem models and a reminder of the world they've been spoofing. If there's any quibble you can make with the film at all is that it probably could've been a bit shorter; as a slice of life without one main character to carry it through it risks becoming a bit redundant. But all the many characters collectively seen in the film are so utterly compelling it hardly overstays its welcome. There is humor throughout, mixed with one ultimately tragic storyline about a transexual who is prominent in the film. Paris Is Burning remains poignant and utterly captivating, 25 years later. It may indeed be a time capsule piece in some ways, but the human stories it captures are still easy to connect with today. And from a technical standpoint as a documentary it is for modern filmmakers a classroom in editing, in letting your character speak for themselves, and in keeping it real. "If you shoot an arrow and it goes real high, hoo-ray for you."